The decoration of the room is good. To my surprise, no in room dinning menu. Called the service desk for a menu, waited half an hour then came with a dinning trolley with fried noodle and claimed I have made the order. Rejected of course and waited another half hour before a menu was delivered. Breakfast - both reception and waitress told me to find my own table. When I got some food and found a table to sit, a captain came and said the table needed to be cleared and I had to sit somewhere else. Definitely not the standard I expect from a Fairmont hotel. 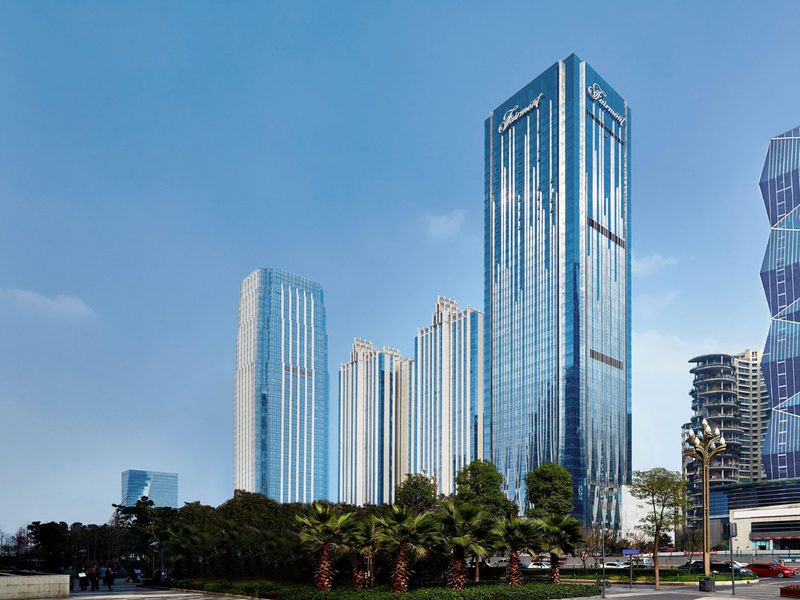 Compared with same category hotels I had stayed in Chengdu, Fairmont might not be mentioned in the same breath as Waldorf Astoria、The St.Regis、Ritz-Carlton and Niccolo. If you regard it as a standard five-star hotel, it appeared what a five-star hotel should be, that’s all! But it has a long way to go before considered a top luxury hotel in Accor. To be frank, there is a huge performance gap between Fairmont and other top luxury hotels (including Marriott group,Hilton group ,LHW...) I have to give my special thanks to the hotel concierge which assist with my luggage when I arrive and guide me to check in warmly. Every single member of concierge staff treats thier job as if it’s an honor to be a part of a family. But all the other staffs were indifferent, no smile、 no greeting、no manners during check in. “ID card” I was shocked by such a short and unmannered sentence with imperative mood! I don’t think this staff in the right position! When I opened my door,there’s a housekeeping in my room! It’s an unavailable room! In the evening, no turn-down service for me even I illuminated the “clean up is needed” light. They ignored member right in Accor. I had the pleasure of staying at the Fairmont Chengdu at the conclusion of our father/daughter China adventure. We both needed a respite from our hectic travels and frenetic pace. We checked in and were greeted with a warm welcome by Fisher and his team. Upon arrival to our room, we knew we were in a special place that would allow us to recover and unwind before our long flight back to LAX. The rooms have every amenity a five star hotel should have and even a few surprises. We also dined at Cube and had our first western meal in over a week. We have loved the food of Sichuan, however, it was nice to have a pizza, a cheeseburger and assorted appetizers. The Waygu steak and Asparagus Spears were amazing I highly recommend them. After an amazing nights sleep on the best beds we have used in China, we decided to visit the Willow Stream spa for a workout and swim before heading to the airport. They have an excellent workout facility that is very clean and has all the latest machines. A very attentive staff and an amazing facility that I look forward to visiting again. A special thanks to George Ju and his team for helping to make memories for my daughter that will last a lifetime. As usual, was well taken care of by the staff at the Fairmont. The staff at the Gold lounge was excellent as always. Candy, Sandara, and Claire were very helpful. Pickup from the airport was smooth, arrangements for my departure were very easy. Used the gym several times, it's kept in excellent condition, fresh towels, fruit, and water. The staff at Fairmont Chengdu always take very good care of our stays. This hotel has been the designated hotel for our employees and guests in Chengdu since their opening in Feb 2017. Candy Zhu and her team on the executive floor in particular always goes above and beyond not just with their hospitality but also professional and efficient support to allow us to conduct business meetings and receive our guests at the executive club lounge. I would really like to compliment their great efforts! After 4 months, i return Fairmont Chengdu again. Everything are familiar. When i walked in the hotel, Jessica was already waited me in the lobby, guided me to the Gold Lounge to Check-in. It was very happy to meet my old friends again in gold lounge. Check-in was quick and efficient. Room was good and this time was a new style suite, i love it. I spend whole day in the gold lounge, Candy, Sandra, Nova and John looks after me very well. Both of them are friendly and easy chat. It was very surprise that Jasmine has move to western restaurant. As a loyalty guest, i know that western restaurant was face to a lot of problem. During this stay, i have my dinner in western restaurant two times, My old friends (Jasmine and Roccio) was very busy because they didn't have enough waiter. But they did their duty. I really hope Jasmine can all the best in the future, make western restaurant better. Overall although it was already 4 month since last time stay in Fairmont Chengdu, but for me it is good to see all my friends are well. Like i said so many times before, Fairmont CHengdu is not just a hotel, but also it is my home in Chengdu. BTW, all performances in the annual party were excellent. I spend a wonderful time during that night. My stay was pleasant and the room was so comfortable. Staff are very helpful. Service level is top notch. Convenient location to commute via public transport. From check in to check out, service was impeccable, stay was very comfortable & quiet, rooms were clean and elegant, spa was exactly as expected. Room is comfortable especially the bedding, Cube bartender Edwin is very good, had very nice time there with tasty food and drinks. Breakfast is also a plus, I will stay again next time. Very satisfied with the hotel service from arrival check in to departure. friendly hotel staff and warm assistance. Pleased and delighted to stay at the Fairmont Chengdu! It was an awesome stay, would love to do a repeat! A short stay but the team were great and very helpful and the room was lovely. Check in process was smooth and the team were able to explain the hotel facilities well. The room was large and well designed and felt very comfortable. The service and quality of the Fairmont Chengdu were some of the most memorable parts of our trip. Jessica and Luke especially were most helpful in arranging reasonably priced yet high quality transport for a day to Mt Emei and to Leshan, as well as for tickets and transportation for a Sichuanese opera, as well as for getting a local SIM card. They really went out of their way for us! The breakfast quality and selection is excellent and we really enjoyed our very large, well-appointed suite, with a large living area, one full bath (two sinks and toilet with bidet function and very large rain shower and separate bath), and one half bath, with a very comfortable king sized bed. The excellent free movie selection was nice for spending the evening in our room. We liked the modern style of the furnishings, the cleanliness was high, and the high level of automation in the room for lighting and curtains was appreciated. We also enjoyed cocktails at Cube and dinner at Chang Yi, and found that the quality of what we had was commensurate with the price. We found the spa staff to not have the best ability to communicate in English and overall found the service/treatments a bit disorganized and also overpriced and suggest some improvements in this regard. The location is in the newest part of Chengdu and away from a lot of the bustle of the city centre yet still close enough to get there quickly. We enjoyed it being a bit quieter around the hotel, there are still amenities within walking distance and there is easy access to the metro/cabs. We also enjoyed the many parks very close to the hotel. There was nearby subway construction near the hotel but it did not affect our stay. Overall, we had a wonderful experience and felt we had good value for money. Chengdu was one of our favourite places to visit in China and when we come back to Chengdu, we'll plan to stay here. The experience was first rate from the moment we stepped inside until the moment we left. Even tough I am a seasoned traveller and spend multiple nights in hotels across the world, I would have to say that our stay at the Fairmont Chengdu was one of, if not the best hotel experiences I have ever had! The service was impeccable, the facilities first rate and the food and beverage beautiful.